Today we live in an increasingly interconnected world – one full of movement and mixture, contact, connectivity, economic exchange and cultural interaction. This is the world of globalization. The mobility and interconnection we see today are of a new magnitude and intensity, largely owing to the advent of modern technology in transportation and communication. However, globalization as a social and cultural process is not a wholly new phenomenon. Many ancient regional systems in both the Old and New Worlds also exhibited similar processes of “globalization,” albeit on a smaller spatial scale and lesser intensity. The formation of the modern global social system is historically contingent upon the connectivity in antiquity. Cross-regional cultural interactions, economic exchanges and political conquests lead to the long-distance transfer of resources, technology and culture, and the ever-changing cultural diversity in both the ancient and modern worlds. In this unprecedented era of globalization coupled with the greatest migration and urbanization in human history, studies of culture contact and cultural diversity has become increasingly important in many disciplines such as anthropology, sociology, history, linguistics, geography, human genetics, and political science. The relationship between past and present makes archaeology particularly significant today although some scholars have argued that the Enlightenment and the advent of modernity marked a thorough discontinuity between the modern and ancient worlds. The archaeology of culture contact can bring a unique and fruitful perspective to bear on many pressing global problems we are facing today, particularly the long-term processes and consequences of culture contact, and the urgent need of protecting cultural diversity and heritage, tangible and intangible, for our common future. The theme of cultural diversity has been a major focus of UNESCO activities since the 1990s, with a strong conviction that respect for various forms and expressions of human biological and cultural diversity is fundamentally crucial to human development and world peace. Now the UNESCO celebrates the 10th anniversary of its “Convention on the Protection and Promotion of the Diversity of Cultural Expressions” adopted in 2005 and ratified by over 120 countries. 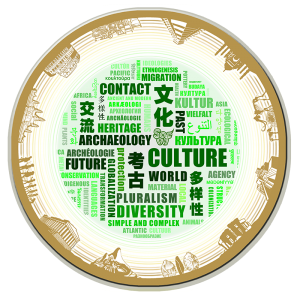 The primary theme for the Second Shanghai Archaeology Forum is the archaeology of culture contact and cultural diversity, a timely subject that archaeologists across the world should consider for many years to come. (4) Through the Public Archaeology Lecture Series, to boost public awareness and appreciation of the significance of ever-increasing archaeological finds, to highlight the potential contribution of their scholarly study to comparative analyses of culture contact, cultural continuity and transformation, and to underscore their relevance and significance to the 21st-century world we inhabit, especially the lessons we can learn for appreciating and safeguarding cultural diversity, fostering social plurality and protecting the vanishing heritage in our globalizing world.